Welcome to a large, sprawling duplex in the German town of Simbach am Inn today. Replete with plenty of glass doors and windows and bursting with lively colours, this simple but stylish house is a designer’s delight and wouldn't look out of place in suburban Canada. Warm wooden accents, stone tiles, comfy textures come together with vibrant versions of green, pink, blue, purple and many other shades to concoct a dreamy family home surrounded by manicured green lawns. The brilliant and creative lighting of Musterhaus Mannheim 159 was rendered by the lighting designers at Licht Design Skapetze GMBH & Co. KG. So come and explore the cheerful and modish surprises of this elegant abode more closely. 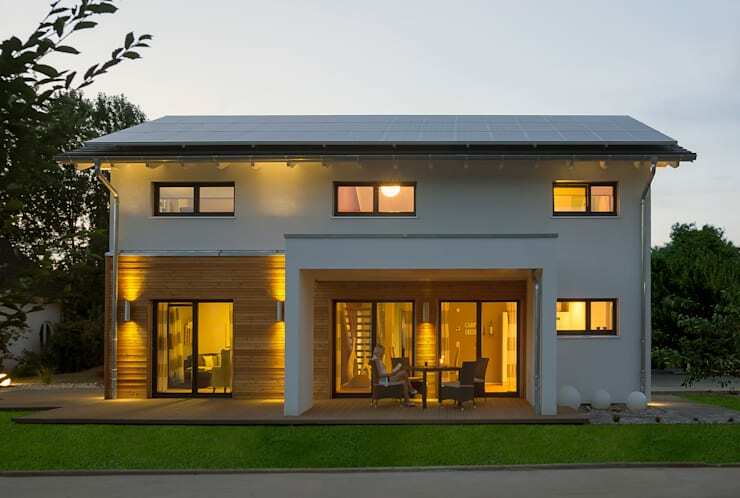 Set amidst trees and verdant green lawns, the façade of this lovely home is simple and elegant. The large windows of the ground floor give us a view of the linear living area, dining area and kitchen. The seating arrangement on the patio just outside the dining area is stylish and cozy, with the contemporary lights on the wooden walls casting a warm glow. 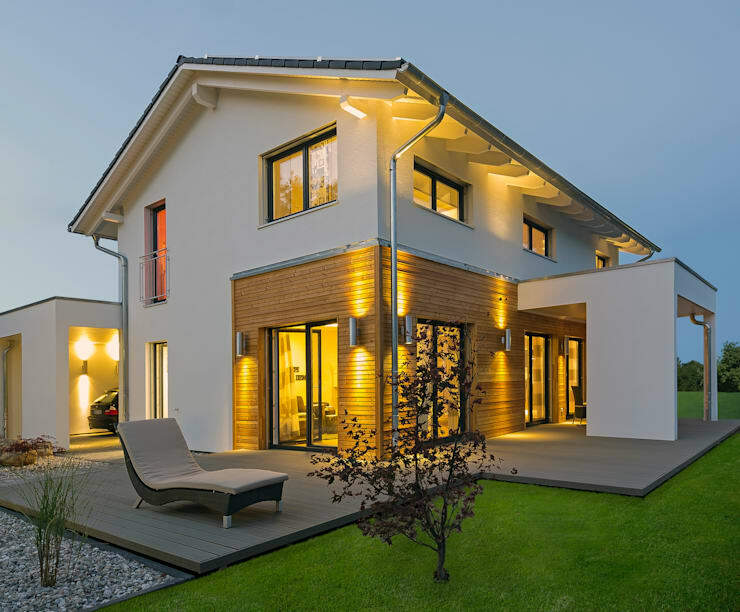 The patterned wooden walls and black frames of the windows and doors are a classy way to break the monotony of the predominating whiteness of the structure. Viewed from another angle, the façade looks stylish and impressive, ensconced by a beautifully manicured lawn resembling a green carpet. We love the glass doors of the multiple entrances leading inside. The car stands outside one entrance, while a comfortable lounger adorns the patio leading to the living area. 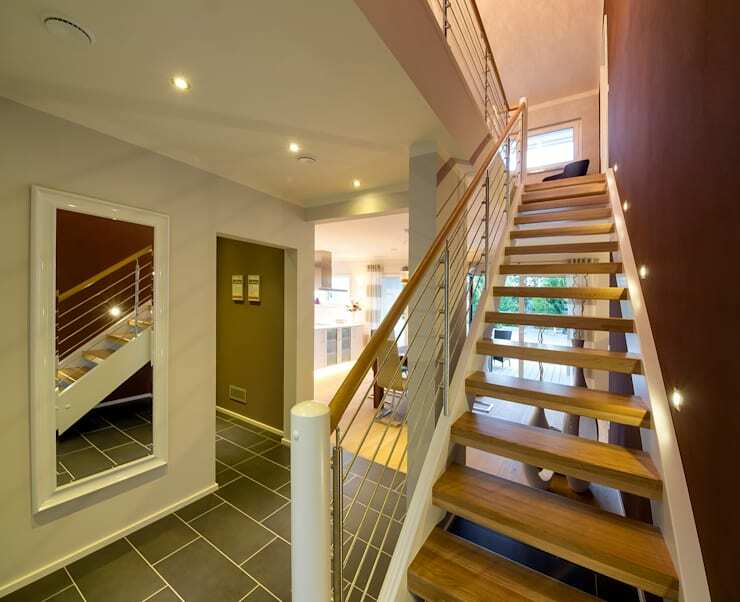 The grey tiles of the hallway and the stylish natural wood staircase offer us a warm, cozy greeting as we enter. We catch a glimpse of a comfortable nook at the top of the staircase, while the large mirror on the wall proclaims pizzazz. Earthy purple greets us along the stairway, while a patch of olive green beckons from the room beyond the mirror. While checking out the alternate entrance through the glass doors of the living area, we were greeted by an uber cool interior. 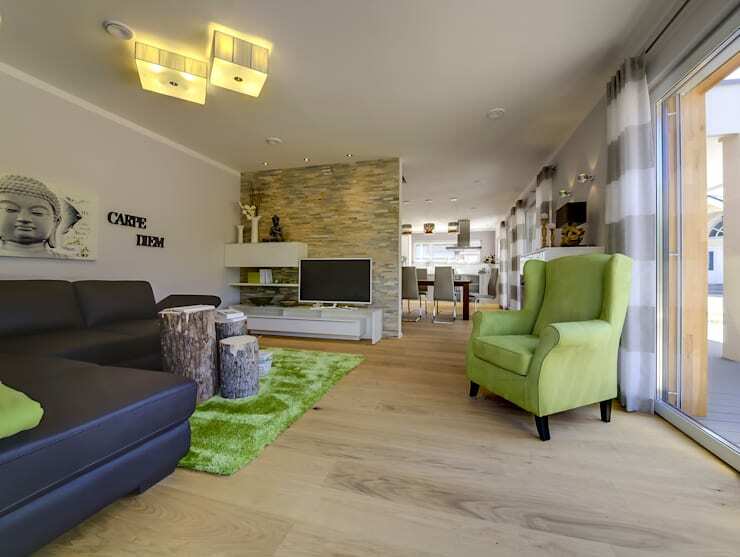 The lush green rug, matching armchair, natural wood floor and nifty log tables bring in the feel of the outdoors, while an L-shaped black sofa makes a bold statement below a picture of the Buddha and the Latin aphorism “carpe diem”. The textured stone wall behind the television is a clever and stylish way to divide the living and dining areas. The furniture here exudes a stylish and modern look, while the futuristic ceiling lights and contemporary showpieces add a dash of glamour. With this picture, we get a perfect idea of how airy and bright the house is, thanks to the abundant use of glass doors and French windows. The cool white and grey curtains match the grey walls and “carpe diem” again makes an appearance on the wall, underlining the “living in the moment” theme of the house. 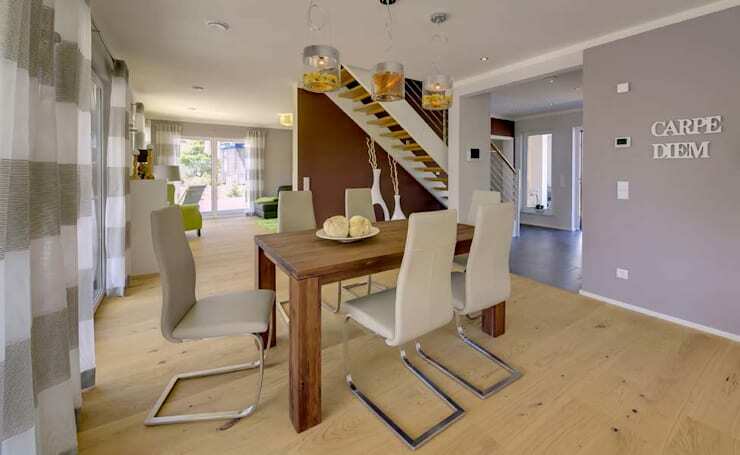 The natural wood dining table looks sturdy and matches the natural wood floor in a lighter hue. And the chairs in white and a futuristic design lend contrast against the table. We love the three unique and gorgeous lights hanging above the dining table, highlighting the overall modern decor of the house. 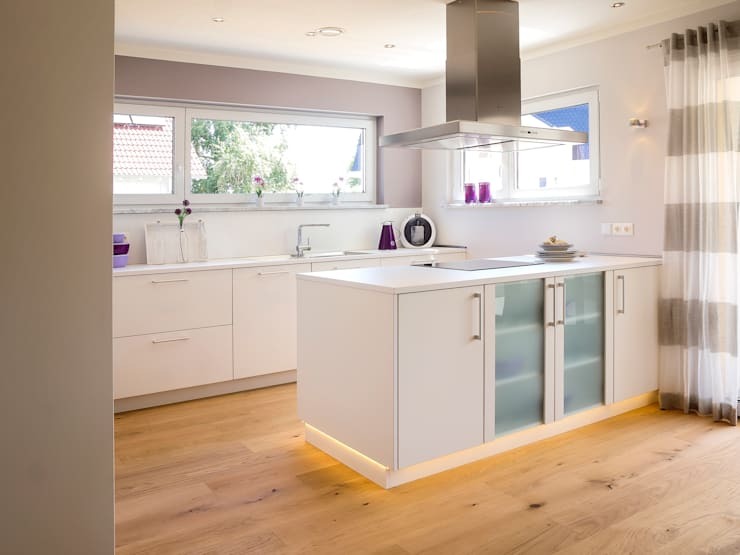 The kitchen looks modern and functional with a predominantly white theme and clean lines for the furniture and fittings. The natural wood floor and white and grey curtains keep the kitchen in tune with the dining and living areas. The glass panels on the white kitchen island look stylish and the vases of pretty flowers on the windowsill add a dollop of outdoor charm to this space. Reposing on the second floor of the duplex, the blue hues in this spacious and comfortable bedroom immediately catch our eye. The blue accent wall is a soothing touch, while the blue artwork and cushions are a stylish addition. Not to be missed are the fascinating lights twinkling like so many stars near the ceiling, and the quirky cabinet on the right with shutters in different shades of blue! The vibrant and colourful theme of the room shared by the young girls in the family takes us completely by surprise! Bright pinks, purples, yellows and oranges infuse the room with liveliness and cheer! 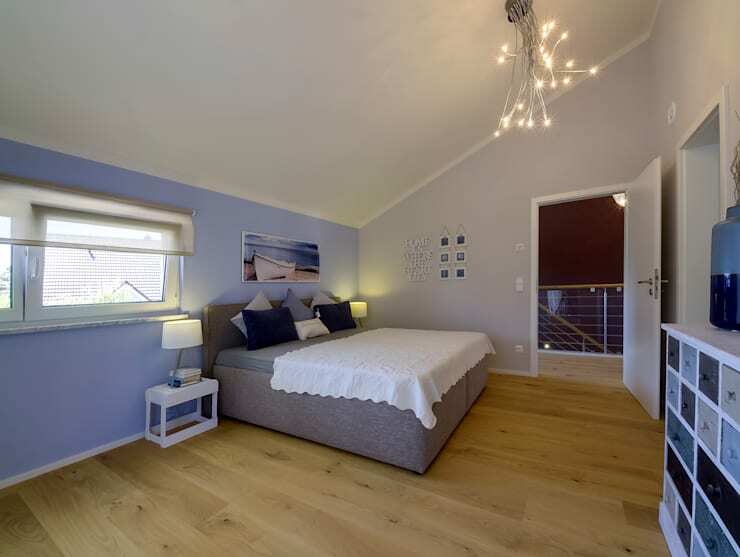 This is a happy room, perfect for studying, playing, chatting or snuggling in the bed with a book. We love the cheerful, informal décor, and the futuristic lights hanging from the ceiling are oh so chic! 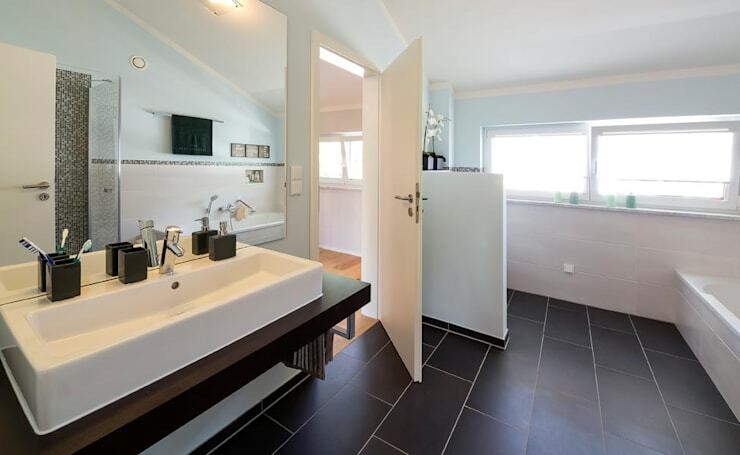 What a spacious and elegant bathroom! The large mirror and washbasin look grand while the black and white colour palette and the clean lines of the fittings are modern and stylish. This is a carefully designed and effectively executed home that brings together an eclectic mix of elements –the natural look, a layer of style and quirkiness, functionality, and futuristic features. All these elements are firmly knit together by the inherent elegance that is exuded by every nook and cranny of this beautiful home. Take another home tour for more inspiring ideas - Stellar Show of Glamour and Style in a Mexican Villa.